From e-mail: "recent wet slab by Emigrant peak as well as a large wet loose (very similar avy activity noted across the valley, and i would guess similar activity in some of the fx zones). Wet slab 3-5’ crown estimation, all look connected/pulled out upon one another,..."
One wet slab released north of Bridger Peak around 1400, probably from a cornice fall. Today (4/19/19) there were more and larger wet slides on top of and adjacent to those that slid yesterday. Activity started before noon and slides were D1.5-D2 wet loose. There was widespread activity in addition to yesterday's slides on all slopes from Bridger Peak through Frazier Basin. Today (4/19/19) there were more and larger wet slides in addition to those that slid yesterday. Activity started before noon and slides were D1.5-D2 wet loose. One wet slab released north of Bridger Peak around 1400, probably from a cornice fall. There was widespread activity in addition to yesterday's slides on all slopes from Bridger Peak through Frazier Basin. From BSSP: "There was considerable cornice growth... in most cases, natural failure sometime early morning, triggering recent wind slabs. Shots were producing very local results, with the exception of orbit in the gum wall, failing size 2 on storm/old snow interface. Also, low on the west wall, an east aspect, we had a 2’ crown triggered by cornice failure. This failed on a maybe week-old interface and partly filled the terrain trap. Similar stubborn results were observed on route, but once warmed up, these slabs became active in lenin, dirtbag wall, and hanging valley triggered on skis this afternoon. The upper a-z’s, pinnacles, and dirt bag wall were problematic with natural wet loose failure in most areas by late afternoon, running on previous melt/freeze crust. In the backcountry, fan mtn and cedar mtn failed well into older layers on east aspects from cornice failure, up to size 3-sizeable avalanches." Observed widespread natural wet loose slides, D1-D2, from Bridger Peak to north of Frazier Basin. Biggest on E-SE aspects in large terrain in northern Bridgers. Wet snow on NE up to 8,000 feet. Saw one maybe recent (poor viz) D2 slab in bowl south of Naya Nuki and some fresh small cornice fall/slabs at ridgeline. Widespread, but nothing major destructive. From e-mail: "[A solo skier] was turning around [on the face of Crazy Peak] after noticing the wind was affecting the snow when he got hit from above and partially buried, losing some belongings. He was able to dig himself out and was uninjured... He said he thought the slide broke 200 feet wide, and ran from the middle of the face to the bowl." A group of skiers reported triggering a small wind slab avalanche in the Northern Bridger Range. No one was caught. A separate group also wrote: "On east facing test slopes near 8,000 feet we found very reactive wind slabs, about 8-12 inches deep." And they saw recent natural activity. 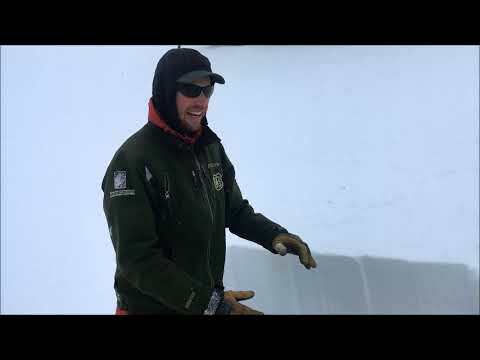 From e-mail on 4/11/19: "We found reactive storm slabs and touchy windslabs near ridgelines. We kicked off a small windslab in 4th of July from the top of the couloir. Attached is a photo of the crown to give you a depth perspective. It was about 6 feet across and 3-4 inches deep." Observed on 4/10/19. See photo. We rode to Lulu pass and had enough visibility to see a N-SS-R1-D2 slide on the big Henderson slide path. We could also see at least five N-SS-R1-D1.5 slides along Miller Bench (between Miller and Wolverine). And, a couple wide R2-D2 crowns on Miller Ridge. All 1-2' deep, not very wide. Likely ran the last day or two after 2-3' of heavy spring snow earlier this week. From e-mail: "some natural, wet slab avalanche activity from yesterday on Mt. Republic. North facing, 8,000'. Triggered by wet loose slides from above. Also, noted one large slab avalanche on the north aspect of Miller Ridge yesterday. Probably triggered by a cornice fall." Evidence seen on Wednesday of large wet slides that likely ran on Monday during heavy rain event. Forecaster observed debris on most steep terrain from Hidden Gully to the Ramp. Debris ran to Goldilocks traverse and the road out of bounds north. Multiple size D2, up to D2.5. From BBSP email: "Good evidence of wet slide activity across the mtn that prob ran late Monday? Close call to nearly upper traverse." Skiers triggered three storm slabs with 4-12" crown depths near Goose Creek. "We toured up to the Bell Lake area with the objective of the adjacent north-facing lines. Dug several pits at the top of the apron of the Good One beside the slide path. Found ECTN6 @ 5cm and ECTN14 @ ~25 cm. Also 15 cm groppel layer at about 70cm. We made a rising traverse across the slide path to test the more cross-loaded west edge and our assumption that the groppel was localized. This traverse caused a very small (D1/R1) slide on the ~5cm interface. We decided to turn around and skied down the apron, then repeated a lap on the apron. The second time we notices some slow moving debris higher in the chute, which was a natural slab of similar size (both us and Bell Lake guides observed a crown about half the width of the chute). We ended up ascending to the ridge further east in a tightly treed area and adjacent slide path where the snow was less wind effected and less reactive. Our initial goal was to ski the lower angle runouts of the slide paths over to the last slide path I have heard called Exit Chute or Going Home. When we noticed the less wind effected snow we kept pushing the skin track up to the ridge. At the top of the ridge I skied off a wind lip and ski cut the eastern aspect on the way over the to Exit Chute/Going Home. The slope was being actively loaded and we had discussed briefly how we had not gathered information on this slope - gathering some first would have been smarter. The resulting crown was 24-30" and spanned about 150'. Probably D1.5/R2). After several pits on the North side and a pit on the same aspect that slid (east), we got similar results at the two interfaces. The big difference I noted were hardness and grain type lemons at the lower interface, the sun crust bed surface of the eastern aspect that slid. On the northern aspect the lemons and the crust were not present at that interface." "Climbed a W-facing couloir to drop over the ridge on our way to Gallatin Peak. Really firm up top. The E-facing couloir we were gonna ski down had gotten some wind-loading, but didn't look too bad. I entered slowly from the north side, and almost immediately set off a small windslab. It wasn't big (crown maybe a foot at the deepest, most of it more like 6"), all new snow, but riding it down that couloir would really not have been a day-brightener. I slid a couple feet, but I was on the edge and it broke around me, so I wasn't caught. Probably about 8am, when we were up there." From an email: "Small cross loaded slopes were easy to trigger. None were very large, but I did kick off numerous small windslabs on multiple aspects. Some large cornices were starting to detach from ridges along Mt. Bole and in the Maid of the Mist area. Numerous had fallen recently and created sizable debris piles. Attached is a picture of one of the cross-loaded ribs that I triggered while skinning by." From instagram: "Easily triggered 3" soft slabs/loose snow slides. NW facing Northern Madison around 11,000' Ran 400' on sun crust. At least 3 intentionally triggered." From e-mail: "while skiing a short, SE-facing slope, we triggered a wet slab avalanche. We both skied to the side, but it was a real wakeup call to the current snowpack. Going from below freezing all winter to sudden warming has left a lot of layers. We didn't measure the slope angle, but it couldn't have been more than 32 degrees in the starting zone. The slide was slightly to skier's right of the slope, and the middle of the slope was only 6" deep, but much deeper where the slide occurred. Maybe 30-40' wide at the crown, ran 80'. A skier reported one natural dry slab avalanche that was triggered by a falling cornice and failed near the ground on the north face of Mt. Blackmore. She also saw multiple loose wet slides on solar aspects in the same area. The slide was triggered by a snowbiker. The rider triggered the slide side-hilling and was buried to his chest. Observed on Friday (3/22), probably ran late on 3/21. Crossed trail and piled 4-6' of debris in creek. We saw natural and skier triggered wet loose avalanches near Fairy Lake. Big Sky Ski Patrol saw a few small natural wet loose slides in closed terrain. A group of snowmobilers reported seeing another group trigger this avalanche on Friday afternoon. Nobody was caught. From BSSP: "...observed a D2.5 avalanche on the NE face of Fan Mtn. that looks to be a bout a 2’ crown likely triggered by cornice fall." Dry loose avalanches were easily triggered on steep terrain in Hyalite. Six inches of recent snow easily slid on crusts buried below it, and was drifted into small wind slabs near ridgelines. These types of small slides are typically not large enough to bury a person, but are dangerous if they catch and carry you over cliffs or into trees. From e-mail: "...today in Hyalite, we were able to get the new snow to slide easily on the older suncrust/windcrust. The new snow was very low density and not cohesive at all. However, places, where the underlying suncrust was most prevalent the snow slid easily. Generally it was just 'sluffs' or small dry/loose avalanches. Enough to knock you off your feet." "On Tuesday (3/12) we observed 3 skiers trigger an avalanche on the north face of Peak 10,602 (the summit just NE of Beehive Peak). We saw the event unfold from a distant ridge, but was able to see that none of them were caught. Later in the day, we ended up at the base of the slope that avalanched and determined the issue to be the same wind slab we had been encountering on numerous N and NE slopes throughout the day. The crown depth was 6-8 inches and was about 100ft wide. The avalanche ran at least 600 vertical feet." Small snowmobile-triggered W. side Fisher Mtn. From e-mail: "The deep slab on the s face of Wilson was not an isolated incident. We observed a huge one on the east face of Wilson, in addition to numerous others in the head of both Dudley and deer, ranging from s/se to due north, all that looked to have gone sometime in the last few days." 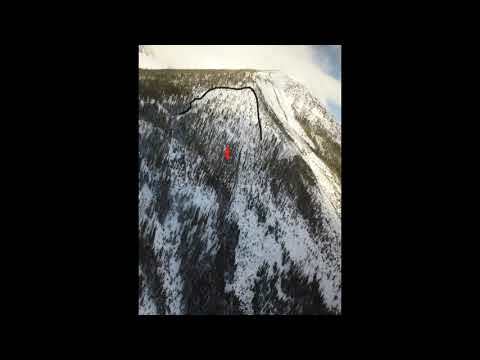 Phone message: "On Buck Ridge in northern Madison Range... Experienced severe cracking then dug a snowpit in the second Yellow Mule. Yielded results of ECTP 24 Q1 on west aspect on layer 16" down on old snow/new snow interface. 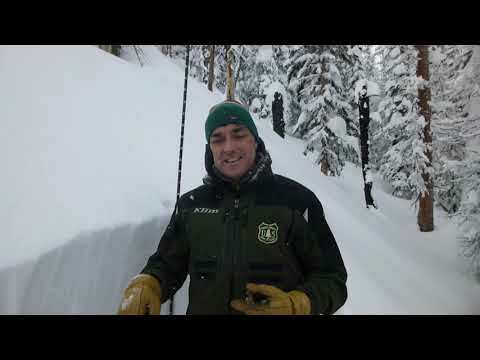 Total snow depth of 6 feet. 24 degree slope." From separate e-mail: "D2.5 avalanche on an NE aspect in Bear Basin in the Northern Madisons, 9600ft, there were tracks in the run out (covered by the debris pile)... running on basal facets. Terrain was very rocky, steep, and visibly wind loaded." A skier in Hyalite found a buried layer of near surface facets (NSF) that was reactive in stability tests and responsible for several avalanches in the Hyalite Peak area. He described this buried weak layer in an email: "It is currently down anywhere from 10-40 cms, above treeline, primarily on W-N-E aspects (not on S, there is a crust). I was hoping that yesterday’s warm temps may have helped, but things felt funky underfoot, and I got an ECTP13 (E aspect, 33 deg, 9900 ft), and bailed on my primary objective. I also observed several natural avalanches (HS-N-D2R2-I) that appeared to have failed on this layer a couple days ago, on Wind loaded N aspects above 10k. Besides this, there were no other signs of instability, no shooting cracks etc." One slide was triggered on a steep (40 deg) southeast facing slope at Round Lake outside Cooke City. It failed 8" deep on a layer of graupel and small facets. An adjacent hill slid at the same depth beforehand. This layer is not on most slopes, but as this slide shows it is on some. Doug was in the area and dug a pit in the crown soon after it was triggered. A slide under the cornice on the northeast face of Abundance looked to be 1 foot deep and 200' wide. A snowboarder reported triggering an 8" deep slab on the south face of Scotch Bonnett in one of the Rasta's. "I’d like to report an avalanche incident that occurred today, 3/6, around 2 PM on the NE face of Mt. Blackmore in the Hyalite Canyon area. On the approach, I dug a pit at 9400’ and found a very stable and deep snowpack, with a somewhat definite weak layer in between high and medium density snow about 8” deep. The layer did not slide or propagate in an extended column pit test, so my partner and I decided do ski the direct line from the summit. I skied first, making a ski cut just below the ridge line that did not result in any sloughing. I skied the line without mishap. My partner followed, traversing onto a shallow, steep pocket, releasing the avalanche. It propagated down and out in both directions, resulting in a v-shaped crown about 100’ across and 8-12” deep. The slide ran from around 9800’ to 9400’. My partner was not caught and was able to traverse out and ski down safely." A skier noted cornice falls and fresh loose snow avalanches due to intense spring sun on 3/3. Several small skier triggered slides and a small natural slide in the new snow on Mt. Blackmore. "The YC Ski Patrol conducted avalanche mitigation work above another one of our roads today. The area is outside of our ski area boundary and receives no skier traffic. A 4lb explosives charge was detonated from an aerial tram and triggered a R2/D2 avalanche that ran to the ground. The crown was 2', the path width was around 100', and it ran 350 vertical feet (crossing the road) to the bottom of the runout zone. The elevation was 7280' on a NNW aspect and max slope angle of 34 degrees. Other sections of this slope were tested with explosive charges, yielding only black holes." Photos and observation courtesy YC Ski Patrol. These slides failed on paths that had released previously in late January. Both paths were heavily wind-loaded, and were most likely triggered by cornice fall. Large explosive triggered slide at Y.C. From YCSP: "Today the YC Ski Patrol conducted avalanche mitigation work above one of our roads. The area is outside of our ski area boundary and receives no skier traffic. A 2lb explosives charge was detonated from an aerial tram and triggered a R4/D3 avalanche that ran to the ground on depth hoar. The crown was 4', The max path width was around 250', and it ran 350 vertical feet to the bottom of the runout zone. The elevation was 8400' on a ENE aspect and max slope angle of 36 degrees. Two sections of road, which were controlled for traffic, were buried with an estimated 15-20 feet deep deposition pile. We’ve seen this path go big in the Spring, but we can’t recall it ever going quite this big." A skier heard a large whumpf after stepping out of his skis and punching through supportable snow in the upper snowpack. They dug a pit and found rounding facets near the ground in a relatively shallow snowpack (HS 140 cm). Stability tests propagated at ECTP15 on a layer above the facets. From BBSP on 3/2/19: "Large natural avalanche pulled out last night/early morning on the backside of north peak of saddle peak in Bostwick canyon, the slide path is known as the 'Y' to local skiers and hasn't run this year, or been skied. Crowns looked to be 3-6ft, it ran further than anything i've seen there in the past decade, knocking over small trees and some old standing dead in the run out. R3 D3.5." Natural Slides on Woodward Mtn. From the email: "While touring Fairy Lake and Frazier Basin, we noticed two large natural slides on the E-facing bowls of Hardscrabble Peak. Low visibility, but crowns looked to be about 2-4 ft. high and 150-300 ft. wide. Fractured at approx. 9,000’, slid approx. 500-800 ft. into the lower angle slopes below. N-facing slopes at 8,800’ were heavily wind-loaded, with a hard wind slab present which made skinning difficult. This 5” wind slab fractured easily under our skis and slid over a layer of light snow from the recent storm." Several natural avalanches were since on White Peak and Cone Mountain from Tepee Basin on March 5th, 2019. The avalanches likely occurred several days prior. 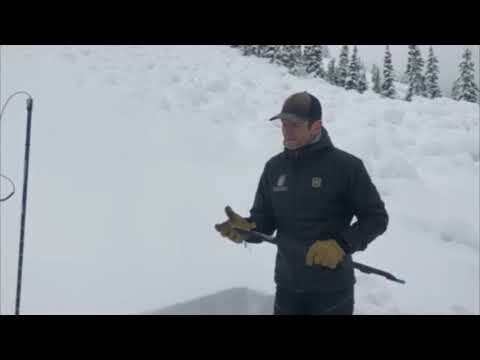 A skier in Cooke City noticed multiple avalanches around Mt. Horinday, Barronette Peak and Mt. Republic. Most avalanches appear to have failed within the new snow or at the interface between new and old snow. However, one of the slides on a steep, rocky convexity on Mt. Republic failed 3-4' deep on a persistent weak layer. Big Sky ski patrol reported this slide on Friday (3/1). It broke sometime Thursday night or early Friday. "...ski cut this little 100' convex roll slope that is 35 degrees for its majority. It slid as expected. ESE facing @ 7500' prominent wind loading from SW. Did not step down through the harder wind crusts. 1-2' deep and 50' wide, ran 100'. Storm snow was getting very upside-down with moderate SW heavily loading E aspects." 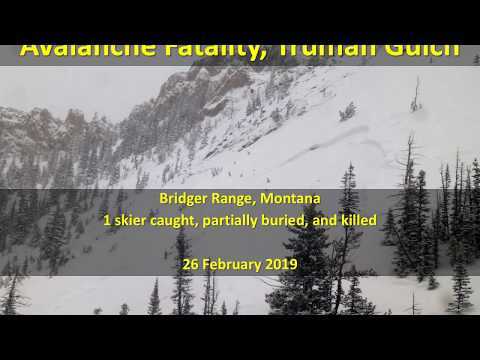 Yesterday afternoon a skier was killed in a slide on the west side of the Bridger Range at the top of Truman Gulch on a run called St. Lawrence. The skier was travelling solo and a separate party of two, skinning uphill, witnessed him triggering the slide and getting swept downhill. They responded swiftly, got a beacon signal and saw his hand sticking out of the snow. The dug him up and did CPR, but the skier never revived. He was carried approximately 1,000 feet vertical down a steep slope causing fatal trauma. The skier was a well known and loved local and we are deeply saddened to report this tragic accident. In the coming days we will release a full accident report. 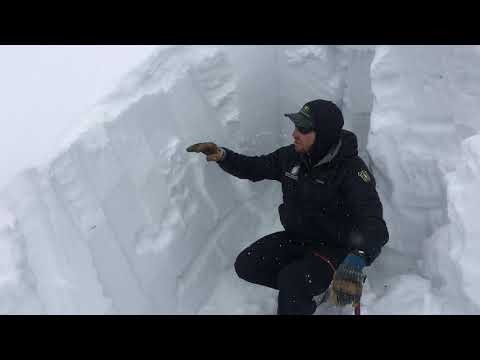 A natural avalanche broke about 3 feet deep on Town Hill above Cooke City (2/25/2019). Snowmobiler partially buried on Henderson Mtn. The GNFAC talked to the rider on the phone, but he did not have many details as this was his first time riding in the area and he had poor visibility. He was on his sled, mid-slope in a gully, filming a friend when he was hit from behind. He had rescue gear and an airbag pack, but the handle for the airbag was zipped closed and he could not deploy it. His upper body was buried under 3" of snow and his lower body was out. He was dug up quickly without injury. His sled was also buried with a small piece sticking out of the snow. He thinks he was on the Fisher Creek side of Henderson Mountain. It was snowing and blowing hard all day. "Today a partner and I dropped in on a ne facing chute just out of big resort boundry, 1 by 1 we both put a series of cuts in the top half of the chute, which had about a foot of snow on top of a firm surface, the snow was slightly wind affected but not firm or slabby feeling. As we advanced we discussed another series of slope cuts was smart as we approached the second rollover. My partner again dropped first lightly cutting the slope, when he reached a safe spot under some rocks and away from the rollover. Next I delivered some hard slope cuts and on my first I cut loose a 7ft acrossx5ft about 12-14in deep chunk of soft slab which then triggered a slab just below about 40ft across x20 same depth which continued the second half of the chute. We did not go out thinking there's gonna be slabs and we will deal them, we we're on our toes thats what kept us from going for a ride but I would say a bad situation to get in. The runout was clean and the debris seemed not to be deeper than 2 ft maybe." From an email: "...went up the Ribbon on the north shoulder of Elephant Mountain. Overall found a pretty stable snowpack, but did find some reactive layers where it had been wind loaded. Attached picture was near the top where the wind was loading the upper bowl of the chute off the ridge line. There was a variable 1-4” thick windslab that broke and propagated easily on the denser snow below." Avalanche was triggered by fifth rider on the slope (2/19/2019). Avalanche broke 2-6' deep, 50 ft wide. Partial Burial on Sheep Mtn. "At around 11 we ascended the slope north of sheep mountain and dug a pit at around 10,300’ on a NE aspect. Our pit was unresponsive. We skinned up to the summit of sheep mountain and dropped into the ENE spines directly off the summit. 3 turns into the slope, the entire 40° slope I was skiing propagated 12-18” deep and 250’ wide. I tried traversing out to skiers left to a clean slope but that slope then propagated even deeper, 18-20” and another 150’ wide. Once the larger slab started pulling my tips down I tried to point my skis downhill to gain some control and steer off the slope. Near the bottom of the face I had traversed onto there was a couple rocky outcroppings that I had to turn around, and the force of the liquid soft slab took me off my feet. I deployed my airbag pack, got hit with a couple waves of snow, and ended up on top with my skis and upper body/airbag above the snow. My partner above me had eyes on me for the entirety as well as a large group of sledders nearby, but it was still a scary experience. The bed surface was a hard crust that was not as obvious on the slightly more north aspect." 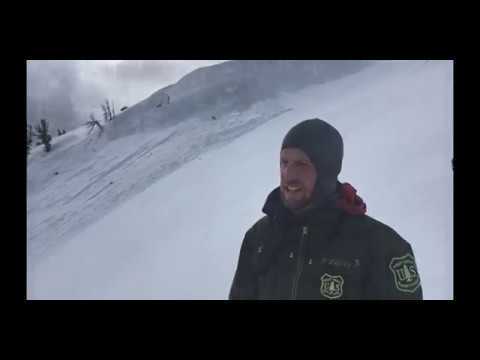 Skier triggered avalanche on Sheep Mtn. From an email: " While skinning...we felt many large collapses in shallow, wind-affected snow. On the ridge crest, we found a ~3cm crust on the surface with massive (~6mm+), striated facets underneath. After skiing down an east-facing, 400', low angle slope, we felt a large collapse that traveled at least 60 feet, but continued rumbling for several seconds and may have propagated back up the slope that we skied. The collapse was triggered in shallow snow in the flats. This weak snow structure near the surface was not present in the next drainage east." We saw this avalanche from the groomed trail to Daisy Pass. It looked as though it was triggered by snow sluffing off the cliffs. It seems to be confined to the new snow from this week. Soft slabs 6-12" deep triggered during control work. On Saturday (2/16) skiers in Beehive observed "Lots of natural avalanches from Friday nights snow. Notice the large cornice sections at the base of the slope. We were impressed with the size of the cornices on the ridge. We noted no collapsing or cracking on the skin up or ski down." Forecaster Note: We saw this crown at 1545 on 2/15/19 after viewing this slope at least twice earlier in the day. We went to the avalanche on 2/16. It appeared to be triggered by a cornice fall and broke 4-8' deep. Saw natural slabs in the cliffs on Mineral peak south of Silver Gate and triggered a few small test slopes. 6-12" deep. 10-30' wide. e-mail from folks staying at Hellroaring Hut: "...we saw the west facing slope above the Hut around 8700’?? had a new slide with a 2-3 foot crown, possible 200 yards in length running up and over a ridge. " 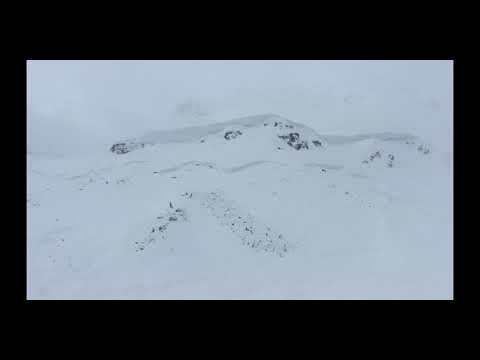 A large snowmobile triggered avalanche in the Gravelly Range (Outside of advisory area) on February 10th, 2019. From email: "One rider was involved in the incident and was fortunate to be on the upper left side of the bowl when he saw the slide start. ... the crown was about 325 wide and varied in depth from 1 to 4 or 5 feet. The ridge line was wind loaded and this was an issue we had discussed as a group and wanted to avoid. We had read the reports for the day and knew that wind loading as well as a persistent week layer were both concerns. .... The rider involved entered the area from around where the road switchbacked and did not realize what was above him due to reduced visibility." From e-mail: "Reporting avalanche on Mt Blackmore, east face. I a skier, remote triggered a wind slab avalanche from about 300 feet above I while skiing the face. I was the 2nd skier. Crown was slightly below ridge line ranging from 6 inches to 2 feet. After noticing the slab breaking under my feet I skied right to safely. Avalanche traveled ~700 feet. Elevation ~10,000 feet." From an email, "Lots of wind slab activity... tough to tell exactly what happened here with everything filling back in so fast. A few quickly-disappearing crowns on ridge line and throughout E face, good debris pile." From e-mail: " Large collapses on any slope with HS of <1m, one pit at 7500 on W aspect and 19 degrees HS 100 cm, yielded ECTP22 sudden collapse on advanced depth hoar 45cm from the ground. Overall just terrible structure. We had collapsing on both E and W aspects. Large shooting cracks. No other avalanche activity apart from large slide on Ernest Miller from several days ago." Skiers got 4-6" wind pockets to propagate in the trees at lower elevations in Beehive Basin. Wind slabs were thicker in more exposed areas and likely more reactive at higher elevations. This was shared with me from one of our Fremont County Search & Rescue members. I have no further information. From an email, "Performed a stability test on a South facing slope, 9400', 190HS, Ectp21, SC 85 cm deep on MFcr rounding facets. We had a very large collapse while in pit and a few others on the climb out. No other signs of instability or avalanches were seen in the Pebble Creek region today." Large collapse on facets near the ground. The snowpack on this slope was less than 3' deep. From an email, "Observed this large avalanche while driving north from Jackson Hole today. (on the E, NE aspect of Sawtell Peak, in the Centennial Mountains)"
Likely released in the last day or so with the Avalanche Warnings on Sun, Mon and Tuesday. GNFAC forecasters' observation: On 2/8/19 we observed 3 recent avalanches with unknown triggers (assumed natural) and one snowmobile triggered avalanche (listed separately as AMu on 2/6/19) along Lionhead Ridge. Three of them, including the snowmobile triggered slide, broke 3-4+ feet deep on sugary weak snow in the lower 1/3 of the snowpack. One avalanche broke 2' deep in the recent storm snow. From an email, "My partner and I skied up bacon rind with plans on skiing the <30 degree run on the east face of Ernest miller ridge. On our way out there we had a large collapse, and saw shooting cracks. We dug a pit at 9,150 ft on a E facing slope and got a ECT P16Q1 about 90 cm down. Before this off in the distance (photo) we saw a massive avalanche in a 35 degree wind loaded NE slope at 9,600. It appeared to be about 1 - 1.5 m deep and 100 ft across." 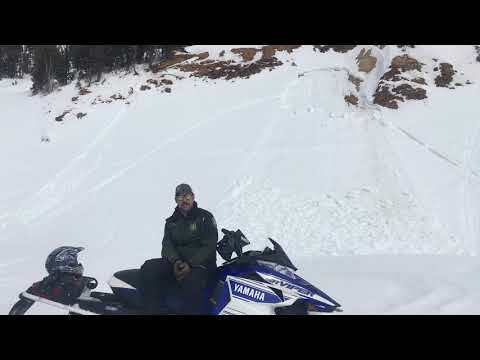 Riders reported cutting across this slope and then an hour later a different snowmobiler triggered it. It was a couple hundred feet wide and debris stopped just above groomed trail. The rider that triggered it was caught and deployed his airbag and able to escape, but his sled was towed back to town. From e-mail on 2/1/19: "The Reas Peak area had 7 slides that I could see from the bottom of the drainage, most of them looked to have occurred with the last storm and had a northerly influence to their aspect. The largest and most recent slide I included in the [above photo], Reas Peak is the highest peak on the left in the photo and the slide path is on a NE aspect. If you look close at the photo you can see a 2-3’ crown on the far left side of the frame on the north aspect of Reas from another slide." Another observer saw a large slide near Lionhead (photo) and one on Reas Peak from the same cycle. 1. "Newish slide with a fresh looking debris pile. Between Alex Lowe and Peak 9806. Appeared to step down into the old snow. Looked like a D2.5-R3, natural trigger." 2/3. "Large natural avalanche on the south face of peak 10,201. Looked to be a day or two old and the crown looked to be 3-4 feet deep in places." This natural avalanche was seen on a NE aspect of Cedar Mountain today (29 January). Natural avalanche on Fan Mountain. Observed on the morning of January 28th, 2019. Natural Avalanche on Fan Mtn. 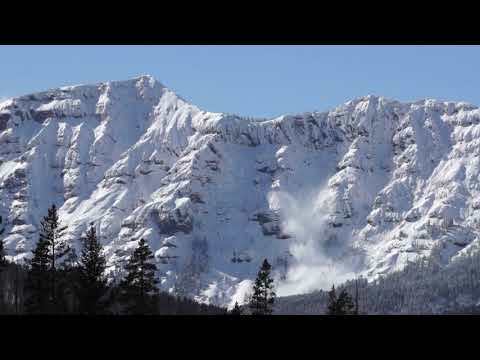 A very deep natural avalanche was observed on Sheep Mountain, on January 28th. From email: "This was southern facing slope of sheep mountain... Crown was at least 8’... very heavy wind loading." From the email: "Two slab avalanches that looked a day or two old. Both East/NE aspect off of Mount Zimmer. One was storm snow/windslab 12'18" crown that ran 300' wide, D1.5/R3 and the other was a small width deep slab in a pocket below cliffs. 4-5'crown, 50'wide, D2/R1." Big Sky Ski Patrol triggered a deep hard slab avalanche during control work on January 28th, breaking on a weak layer of facets that formed in early December. From email: "we ... observed several natural avalanches in the long, steep gullies on the west side of Beaver Creek." A group of skiers observed propagation in their stability tests and experienced collapsing in the main fork today. A separate group of ice climbers heard two different natural avalanches and observed active wind loading at higher elevations. A climber from a third group watched a natural avalanche next to the Mummy. 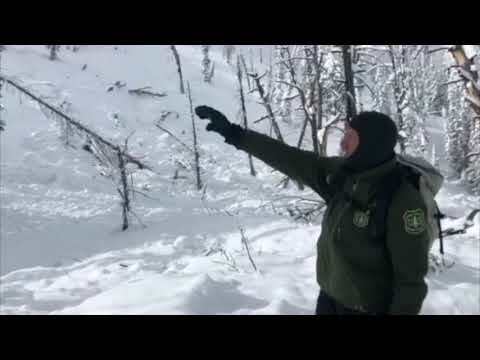 Skiers triggered this avalanche in dense trees while ascending Mt. Ellis. From the email: "While subsequently skiing up through dense trees climbing to the north to attempt to reach the mid section of the going-home chute, a medium-size bowl-shaped opening in the trees released a soft slab just as we were entering the opening. The crown was ~24” deep and ~80-100’ across. Total snow depth in that area was less than three feet. The avalanche ran probably 500 vertical feet down a shallow gully. Neither my partner nor I where caught but way too close for comfort." Skiers reported multiple large natural avalanches in the Arrastra drainage in the Absarokas. They estimated the recent storm cycle totals to be 3-5'. From e-mail: "We observed a rather large natural slide come down within a 100' of us as we were beginning our ascent in some thick old-growth Douglas Fir woods next to the terminus of a large south-facing gully/slide path. we knew there was a party of at least two above us. I quickly put my beacon in search mode and scanned the toe of the debris. No signals. We separated by a safe distance and I led up the skin track which bordered the lower 400' of the debris field with my beacon in search mode. No signals. At 400' up the Arrastra Road crosses the path. At this point my partner and I met up. I crossed the debris angling downhill to the west continuing to search for any potential signals. No signals. I skinned up the remaining west border of the path in search mode. Back at the road I finally heard and saw the other party of 3 come out of the woods above us. Very relieved we were. They thanked us for our concern and we all descended and left for the day. Since last Friday I would realistically say that 3'-5' of new snow had accumulated. I'd been in here Mon.-Fri. this week and aside from Tuesday it had been snowing at high rates at all times. This particular path had slid to within 300' of the upper road around New Year's. It is a south facing path with two distinct gullies and runs from just under 10000' down to 7600'. Quite a few other large crowns were observed higher in the bowls, mostly being confined to storm snow. But I'm sure some were failing on PWLs at the ground and within the snowpack." 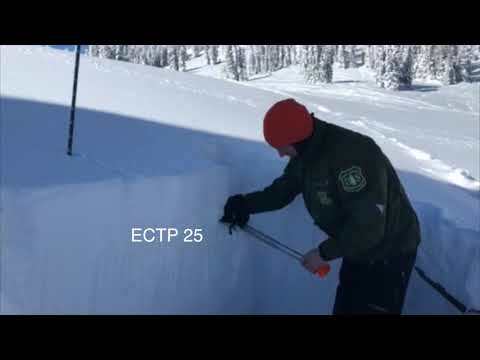 Skiers in Frazier Basin found poor stability, noting multiple debris piles from recent avalanches and propagating test results (ECTP27). A skier triggered this slide around two o'clock in Bradley's Meadow on 1/26. From e-mail: "The snow propagated when I made my first turn on a convex roll above the slope skiers right of the main meadow, just before the flat area before going up The Ramp. The slab broke right under my feet and propagated 20-25 feet on either side of me. The crown was 7" deep where I triggered it but some spots of it were as deep as 13". My friends and I decided that the slide was R3 and D1-D2. Luckily I was able to ski out of the slide right when it propagated so no one was caught in it." From YCSP: "One of our patrollers spotted a snowmobile triggered avalanche on Cedar Mountain this afternoon. The patroller reported a track entering and exiting the path. The slope was NE facing at approximately 8,600’. It was difficult estimating the dimensions of the slide as the visibility was limited and we were quite a ways from the avalanche." From text: "this one was interesting because it was so low angle and in quite tight trees. We were in a zone south of Livingston today (1/26/19), near 9k’, NE aspect in dense timber not far from a ridge top. The slide may have been remote triggered by us skinning up or a large wind gust that came from the other side of ridge. We were touring up low angle terrain and had multiple large collapses on our ascent. We came to what was going to be our turn around point where my brother and I were discussing where we would rip skins and drop in. Before we proceeded into the timber on a 28deg slope we noticed a lot of tree bombs then saw the slide coming through the trees and taking out a couple of 10” diameter snags along the way. These trees were barely skiable due to how tight they were and the starting zone was only a hair over 30 deg. The crown we could see looked to be 3’, and 300’ wide. I’m unsure on the the distance it ran, but estimate 500-800 vertical ft. The main point I got from this slide was that we were crowding connected terrain, things are sliding at the very relaxed end of the slope spectrum, and don’t be lulled into a false sense of security in fairly dense timber." This slide was observed by skiers near the south boundary of Bridger Bowl. The slide ran over the south end of the cliffs into the Going Home Chute. It was described as a natural by the patrol, but it could have been human triggered. Four skiers were ascending a steep, heavily treed slope and triggered a large avalanche. The two skiers highest on the slope grabbed trees, and the lower two were caught and partially buried. One died from trauma at the site, and the other was air-lifted to emergency care with serious injuries. (A more detailed accident report will be available soon. Check back in a day or two.) Our deepest condolences go out the family and friends of the victim. Skiers touring into Specimen Creek wrote, "We got a lot of heart pounding collapses and shooting cracks." Skiers got collapses and cracks as they toured up Lick Creek. They reported, "1 large whumph on 26 degree NE terrain @7600’. Investigated and likely weak layer was 3-4 mm facets down 70cm with total HS 105." 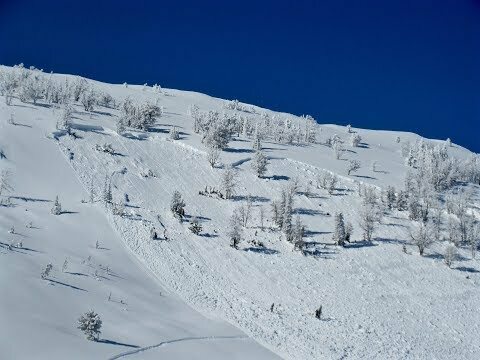 Natural avalanche reported by ski patrol. Occurred around 1230. Likely cornice triggered. Strong winds blowing all day, drifting 20” of snow from the weekend.